The Prime Minister, Shri Narendra Modi, today chaired the Combined Commanders Conference on board INS Vikramaditya at Sea, off the coast of Kochi. This is the first time that the Combined Commanders Conference has been held on board an aircraft carrier. The Prime Minister inspected a Tri-services Guard of Honour this morning at INS Garuda at Kochi, before arriving on board INS Vikramaditya, where he was received by the three Service Chiefs. After the Conference, the Prime Minister witnessed an operational demonstration of India’s naval and maritime air capabilities. The operational demonstration included take-offs and landings of naval fighter aircraft from INS Vikramaditya, missile firing from a warship, flypast of helicopters and fighter aircraft, marine commando operations, and steam-past of warships, including INS Virat. 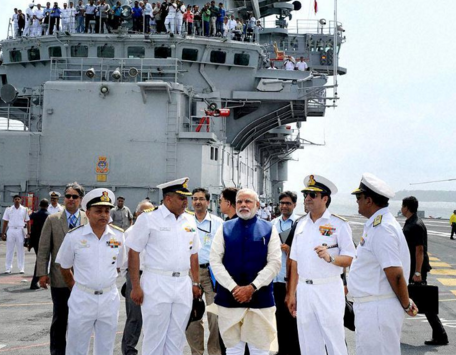 The Prime Minister interacted with soldiers, sailors and airmen on board INS Vikramaditya. It is a great pleasure and privilege to join our military leaders again. I am delighted that we are meeting at a base outside Delhi. I am sure you can feel a difference, and not just because of Indian Navy’s hospitality. Kochi is at the head of the Indian Ocean and at the crossroads of our maritime history. India’s history has been influenced by the seas. And, the passage to our future prosperity and security also lies on this ocean. It also holds the key to the fortunes of the world. This aircraft carrier is the instrument of our maritime power and a symbol of our maritime responsibility. The Indian Armed Forces have always been known not just for the power they represent, but by the maturity and responsibility with which they wield it. They defend our seas and protect our borders. They keep our nation secure and our citizens safe. And, in calamity and conflicts, they do more than just bring relief and hope to our people. They lift the spirit of the nation and win the trust of the world. In Chennai, you battled the fury of rain and the river to save lives. In Nepal, you served with courage, humility and compassion. And, as in Nepal, in Yemen’s conflict, you held out your hand to every human in distress, not just fellow citizens. Our forces reflect our nation’s diversity and its unity. They embody the timeless culture of India and the finest tradition of our military. And, their success comes from the leadership that you provide. Today, I express our nation’s gratitude to our military. I pay homage to those who made the supreme sacrifice, in silence and service, so that India marches ahead. Our thoughts are with the soldiers keeping vigil on the harshest frontiers of the world; with their families that say uncertain farewells when they leave home; and, their loved ones who must sometimes bear their coffins. I know how an officer, in the prime of his youth, feels when he does not make the next grade, not because he was not outstanding or was less deserving, but because the room above was small. So, to honour your service and uphold your welfare will always be our solemn duty. For this reason, we have moved with speed to implement the One Rank One Pension promise that had remained unfulfilled for decades. And, we will build the National War Memorial and Museum that you so richly deserve in the heart of our nation’s capital. We will also improve skills and opportunities for our ex-servicemen, so that when they leave the Service, they can still serve the nation with pride and dignity. I also pay tribute to our internal security forces. Their valour and sacrifices defeat terrorism in Jammu and Kashmir, reduce the violence of Left Wing Extremism and keep our Northeast more peaceful. I complement our negotiators for bringing new hope in the long standing Naga problem. India is at an exciting moment of change. There is a high tide of hope and optimism in the country. There is a new level of international confidence and interest in India. We have become the fastest growing major economy in the world. And, our economy is on a more stable path. Our factories are humming with activity again. We are building the next generation infrastructure at a higher pace and with an eye to the future. Foreign Investments are rising sharply and so is India’s ranking as a place to do business in. Every citizen can see a future of opportunities and fulfilled basic needs with confidence. This is important for India’s prosperity, and also our security. In an inter-dependent world, India’s transformation is closely linked with our international partnerships. And, so is our security. So, there is new intensity and purpose in our foreign policy. In the East, we have strengthened our traditional partnerships with Japan, Korea and ASEAN. We have made new openings in the region, including with Australia, Mongolia and Pacific Islands. We have extended our reach in the Indian Ocean Region, and for the first time articulated a clear strategy for our maritime region. We have raised our engagement with Africa to a new level. We have retraced our ancient links to Central Asia. We have established closer relations and security cooperation in West Asia and Gulf, even as we have revived our close relations with Iran. Russia has always been a source of strength for us. It remains important for our future, too. With the United States, we have advanced our partnership in a comprehensive manner, including in defence. Our strategic partnerships in Europe have deepened. Across the world, India is seen not just as a new bright spot of the global economy. It is also seen as an anchor for regional and global peace, security and stability. And, as the world seeks to deal with rising threat of terrorism and radicalism, countries across all regions, including in the Islamic world, have reached out to seek cooperation with India. Above all, it is our neighbourhood that is most critical for our future and for our place in the world. But, ours is a difficult neighbourhood with the full spectrum of security challenges. We see terrorism and ceasefire violations; reckless nuclear build up and threats; border transgressions; and, continuing military modernization and expansion. The shadow of West Asian instability is becoming longer. Beyond that, our region is marked by uncertain political transitions, weak institutions and internal conflicts. And, major powers have also increased their engagement in our land and maritime neighbourhood. From Maldives and Sri Lanka in the seas to Nepal and Bhutan in the mountains, we are working to safeguard our interests and our relationships. The Land Boundary Agreement has boosted our growing relationship and security cooperation with Bangladesh. We are engaging Pakistan to try and turn the course of history, bring an end to terrorism, build peaceful relations, advance cooperation and promote stability and prosperity in our region. There are many challenges and barriers on the path. But, the effort is worth it, because the peace dividends are huge and the future of our children is at stake. So, we will test their intentions to define the path ahead. For this, we have started a new NSA-level dialogue to bring security experts face to face with each other. But, we will never drop our guard on security and we will continue to judge progress on their commitments on terrorism. We remain committed to help the great Afghan people build a united, peaceful, prosperous and democratic nation. We are also pursuing closer relations with China to harness the full potential of our economic partnership. We will aim to address outstanding issues, maintain stability on the border, and develop greater mutual understanding and trust in our overlapping neighbourhood. I believe that India and China can engage constructively across the complexity of their relationship as two self-assured and confident nations, aware of their interests and responsibilities. We will continue to strengthen our defence capabilities and infrastructure, engage our neighbours more closely and strengthen our regional and global partnerships, including in maritime security. In a world of rapid changes, India faces familiar threats and new ones. Our challenges cover land, sea and air at the same time. It includes the full range, from terrorism to conventional threat to a nuclear environment. Our responsibilities are no longer confined to our borders and coastlines. They extend to our interests and citizens, spread across a world of widespread and unpredictable risks. As our world gets transformed, the character of economies change and technology evolves, the nature of conflicts and the objectives of war will also change. We know that old rivalries can play out in new theatres such as space and cyber. And, new technologies offer us new ways to be more effective against both traditional and new challenges. So, we in India must be ready for the present and prepare for the future. India is confident that our defence forces are prepared to deter and defeat any misadventure. Our strategic deterrence is robust and reliable, in accordance with our nuclear doctrine, and our political will is clear. We have speeded up the process of defence procurements. We have approved many long pending acquisitions. We are taking firm steps to address shortages and cater for replacements. We are advancing the pace of expansion of border infrastructure and improve the mobility of our forces and equipment. This includes the strategic railways to the border region. We are transforming defence manufacturing in India through radically new policies and initiatives. Our public sector is gearing up to the challenge. The private sector has responded with great enthusiasm. And, foreign defence companies are coming here with ambitious new proposals for Make in India, from fighter jets and helicopters to transport aircraft and UAVs; from avionics to advanced material. We can never call ourselves a secure nation and a strong military power unless we develop domestic capabilities. This will also reduce capital costs and inventories. In addition, it will be a huge catalyst for industry, employment and economic growth in India. We will soon reform our procurement policies and process. And, our offsets policy will become a strategic tool for improving our capabilities in defence technologies. Defence technology will now be a national endeavour that taps the potential of all institutions in our country. Armed Forces will be crucial to the success of Make in India Mission. I am encouraged by your localization plans, especially in the capital intensive Navy and Air Force. We want to see clear targets and goals on domestic acquisition; more clarity on specifications; and, greater involvement of our forces in innovation, design and development, especially from those who wield the weapons in the field. Above all, we look to our Armed Forces to prepare for the future. And, it cannot be achieved by doing more of the same, or preparing perspective plans based on outdated doctrines and disconnected from financial realities. In the course of the past year, I have seen progress, but I also feel that our forces and our government need to do more to reform their beliefs, doctrines, objectives and strategies. We must define our aims and our instruments for the changing world. At a time when major powers are reducing their forces and rely more on technology, we are still constantly seeking to expand the size of our forces. Modernisation and expansion of forces at the same time is a difficult and unnecessary goal. We need forces that are agile, mobile and driven by technology, not just human valour. We need capabilities to win swift wars, for we will not have the luxury of long drawn battles. We must re-examine our assumptions that keep massive funds locked up in inventories. As our security horizons and responsibilities extend beyond our shores and borders, we must prepare our forces for range and mobility. We must fully incorporate the power of digital networks and space assets into our capabilities. Equally, we must be prepared to defend them, for they will be the first targets of our adversaries. And, networks must be seamless and integrated across agencies and forces, and are precise, clear and quick in response. We have been slow to reform the structures of our Armed Forces. We should shorten the tooth-to-tail ratio. And, we should promote jointness across every level of our Armed Forces. We wear different colours, but we serve the same cause and bear the same flag. Jointness at the top is a need that is long overdue. Senior military leaders must have experience of tri-service commands, experience in technology-driven environment and exposure to the full spectrum of challenges – from terrorism to strategic. We need military commanders who not only lead brilliantly in the field, but are also thought leaders who guide our forces and security systems into the future. We should learn from the experience of the others, but we must frame our systems and commands on our own genius. Our National Defence University will be a reality soon. We also need reforms in senior defence management. It is sad that many defence reform measures proposed in the past have not been implemented. This is an area of priority for me. We must also have a comprehensive strategy for external defence engagement, to develop our capabilities and fulfill our responsibilities to advance peace and stability, including in our extended maritime region. We have kept peace in the blue helmet of the UN. And, our forces can be messengers of peace and hope, for example, by taking medical ships to remote island nations, and building relations with other militaries. In conclusion, to transform our country, every institution must reform itself. Our nation will progress when we all move forward in step. And, we expect you to lead from the front in expenditure reforms or in clean energy and energy efficiency. As you reform, we will do our best to meet your needs and keep you prepared. As our economy grows, we will be able to secure ourselves better. In turn, India pursues its dreams in the comfort that it is secure in your hands. This is a year of anniversaries of the end of two World Wars and our 1965 conflict. This is also a year when humanity has come together in the United Nations to combat poverty and climate change. In the memories of the great tragedies of the past and in our united efforts for a better world, we are reminded of the enduring human story of progress and peril. And, of the responsibilities that men and women in uniform bear. To serve the cause of peace. To become the sentinels of progress. I know that our forces live by that creed. For our nation, for our friends, and our world. And, you will help India rise to its promise and its place in the world.